Las Vegas is one of the most popular vacation destinations for Americans, and as such, it doesn’t have a true off-peak value season. But, with countless daily flights to Vegas and innumerable hotel rooms on and off the Strip, it’s not hard to get a deal on a vacation package. You just have to know where to look. I’ve selected five travel providers that consistently offer value-packed vacations, whether you’re looking for a pre-arranged deal or one with more options, a last-minute bargain, or an airfare-hotel-and-extras package. Liberty Travel appeals to both do-it-yourselfers and travelers who need a little more hand-holding, since it’s an online travel agency with more than 200 brick-and-mortar outposts, mostly on the East Coast and in Florida. The agency also has customer service representatives available via email, phone, and fax. It offers hundreds of packages for destinations across the U.S., including Las Vegas. Liberty Travel’s Vegas packages usually include airfare, hotel, and many notable extras. Packages may come with gambling vouchers; two-for-one meals and/or drinks; spa discounts; shopping coupons; show discounts; admission to casino attractions; fitness-center passes; and tours of nearby Laughlin and Primm, Nevada. Below are three of Liberty Travel’s packages for travel in early 2007, not including additional [% 14164 | | taxes and fees %] for airfare. Although the packages expired before press time, they illustrate the typical airfare-accommodations-and-extras packages that Liberty Travel consistently offers. Just $179 got you round-trip airfare from Los Angeles and three nights at the Flamingo, plus two-for-one cocktails, brunches, Second City comedy show tickets, and optional tours of Laughlin and Primm (both including food vouchers or buffet lunch). Departures from other cities were available at higher prices, including $255 from Philadelphia, $289 from Chicago (O’Hare), $315 from Dallas (Ft. Worth), and $329 from Atlanta or Boston. Liberty Travel’s Paris package featured three nights at the centrally located Paris casino-hotel and airfare from Los Angeles. In addition, there were two-for-one Eiffel Tower tickets, a $50 dining credit, 15 percent off any Mandara spa service, and Laughlin and Primm tours. Prices from other cities were: $295 from Philadelphia, $335 from Chicago (O’Hare), $349 from Dallas (Ft. Worth), $379 from New York (Newark), and $389 from Atlanta or Boston. For less than $250, this package included round-trip airfare from Los Angeles and three nights at Treasure Island. Also included was a $15 dining credit, $10 off Cirque du Soleil tickets, a $20 slot-machine voucher, a “special amenity” from Planet Hollywood, and tours of Laughlin and Primm. The package cost $289 from Chicago (O’Hare), $385 from Boston or Dallas (Ft. Worth), and $419 from New York (Newark). If you’re a procrastinator or spontaneous trip-taker, Site59‘s bundled packages may appeal to you. This last-minute deals website is my favorite for quick weekend trips. It allows you to book anywhere from two weeks to three hours before departure. The downside is that there’s no guarantee that your preferred dates or hotels will be available, and you may have to spend more than the listed low price to stay in a hotel in a prime location. When I priced packages in mid-December, Site59’s rates for airfare, car, and hotel packages were all less than the cost of the same flight from the airline itself. Site59’s packages change frequently, but I’ve included a few vacations below to represent the types of packages it offers. Prices include taxes and fees for airfare. Packages departing from Washington, D.C. (Dulles), started as low as $284 for the upcoming weekend. The package included round-trip airfare and three nights at Circus Circus. An Alamo rental car would’ve added $52 to the package. Site59 also offered about a dozen other hotel options at varying prices, including $3 extra for the Tropicana, $24 for the Las Vegas Hilton, and $160 for the Venetian. Day-of-departure packages from San Francisco were a steal when I checked. Seven nights at the Tropicana and round-trip airfare started as low as $293. A compact car would have cost an additional $77. Other hotel upgrade options included the Hard Rock Hotel and Casino for $61, Harrah’s for $95, and MGM Grand from $199. Five-night vacations started at $348, including round-trip airfare from Houston’s Bush airport and accommodations at Tropicana. A rental car for the week cost an additional $87. Had I wanted to choose a different hotel, I could have picked Excalibur for $51 extra, Aladdin for $53 extra, or Luxor for $89 extra, among a handful of other options. Southwest Vacations, Southwest Airlines‘ vacation offshoot, offers packages to more than 40 destinations in the U.S. Las Vegas is well represented since it is Southwest’s number-one airport, with more than 225 daily flights. Southwest Vacations’ deals can include airfare and hotel; airfare, hotel, and car; airfare and car; or any of the three, plus many extras, from show tickets and day trips to shopping packages and weddings. In addition, Southwest Vacations also provides round-the-clock traveler assistance, and Vegas travelers can take advantage of help from Vegas-based customer service representatives. Its packages are very flexible, allowing you to choose among flight and hotel options at varying prices, and then to add on any number of extras. I’ve included three of Southwest Vacations’ typical packages below. Rates include airfare taxes. A two-night package with a few extras comes to under $500 from Southwest Vacations. This offer includes round-trip airfare from Hartford, two nights in a deluxe room at New York New York, and a deluxe Hoover Dam tour. Also included are a tour of Laughlin and Planet Hollywood specials (a $5 coupon and VIP seating). Purchased separately, the vacation would total about $50 more. Round-trip airfare from Austin and three nights at the swanky Palms casino cost $510 from Southwest Vacations. In addition, Planet Hollywood extras and a tour of Laughlin were included at no extra cost. Priced separately, the package came to $536, not including room tax or extras. An airfare-hotel-rental car package came to $567 from Southwest Vacations, based on departures from Seattle, five nights’ accommodations at Excalibur, and a Dollar economy-sized car. Also included are the standard Laughlin tour and Planet Hollywood gifts. This package represented the most savings—$93 less than purchasing each component separately. The online travel agency behemoth has a wide variety of Vegas packages, categorized as “On the Strip,” “Excitement,” “Spa Indulgence,” and “Special Offers,” that allow you to customize your own package by choosing between dozens of hotel and flight options. You can also book cars, activities, tours, show tickets, and even wedding chapels on Travelocity. By using Travelocity to book every part of your vacation, it claims that users save an average of $220 when compared to booking each component a la carte. Here are three bundled vacations representative of the types of packages Travelocity offers. Prices include taxes and fees. A basic four-night package including airfare from Los Angeles and accommodations at the Monte Carlo hotel and casino sold for $328 on Travelocity. The same flights and hotel stay purchased separately cost about $41 more. Airfare from Dallas (Ft. Worth), three nights at Bally’s hotel and casino, and a three-day economy car rental is $531 on Travelocity, more than $100 less than booking each piece a la carte. Five nights at Bally’s, round-trip airfare from Boston, and tickets to both Blue Man Group, and Madame Tussaud’s cost $800, offering savings of about $38 over pricing each component separately. “Vegas.com usually undercuts everyone else,” says Sarah Pascarella, SmarterTravel.com’s vacations editor. Offering information on everything Vegas-related, including a travel guide with insider travel tips, Vegas.com also sells vacation packages and hotel rooms, as well as tours, tee times, and show tickets. You can also call or email Vegas.com’s customer service representatives for assistance 24 hours a day, seven days a week, or visit a Vegas.com concierge desk at one of more than 30 locations in Vegas. The website offers flexible packages that allow you to select your preferred travel dates, flights, and hotels. Especially helpful is Vegas.com’s Low Fare Finder, which displays the cheapest travel dates within three days of your selected dates. Below are three examples of the kinds of packages (including taxes and fees) you can find from various departure cities on Vegas.com. 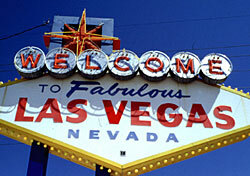 Round-trip airfare from Minneapolis and two nights’ accommodations at Circus Circus cost $274 on Vegas.com. When each component was priced separately, the same itinerary cost $371, meaning Vegas.com’s vacation was $97 cheaper. Vegas.com was offering four nights at the Stratosphere and round-trip airfare from Orlando starting at $437. For the sake of comparison, I checked the price of airfare and accommodations separately, and found savings of $45 by booking the package. This five-night package included airfare from New York (JFK) and a stay at a Fremont Street casino-hotel, Fitzgeralds, at the end of February. When priced separately, the airfare and hotel together cost more than $650.